This is my kind of Jesus. Not the wimp who timidly taps at Holman Hunt’s cottage door in The Light of the World. Nor the misty eyed Jesus of Warner Sallman who looks as though he is posing in the photographer’s studio, wishing he was off somewhere else. This is the purposeful Jesus, irresistibly strong, who kicks the door off its hinges and strides resolutely into hell to rescue his people from Satan’s imprisonment. Fra Angelico emphasizes the violence of the entrance with the lower hinge still fixed to the door frame, stark black against the light flooding in. And there is the comical figure of the unfortunate demon who was standing behind the door at the moment of impact, now helplessly pinned beneath it. The force of the blow has cracked the floor and the ceiling, while the other demons are heading deeper into hell, powerless to resist the intruder. Jesus, bearing the red-cross flag that symbolises the resurrection, is shown stepping through the air on a small cloud: this is the resurrection body of Jesus, still bearing the marks of crucifixion, but now miraculous and all-powerful, able to pass through walls and travel distances in no time. As Paul says, ‘sown in weakness, raised in power’ (1 Corinthians 15:43). Two long nails stick out of the door where it has been dispatched, perhaps to remind us of the nails that held Jesus to the cross. But now they lie bent on the floor, used, defeated, finished. In Mark 3 Jesus likens himself to a thief, who ties up the strong man in order to plunder his goods (Mark 3:27), and he assures us that not even the Gates of Hell will prevail against his church (Matthew 16:18). Like the gates of Mordor in Tolkien’s The Lord of the Rings, the gates of Hell may look dark and impenetrable to us. But Jesus with disdainful ease flattens them, strides in and frees those who have been caught in Satan’s thrall. Jesus certainly is meek and mild. He is a servant king who humbles himself to serve those who should be serving him. But he is also tough, resourceful and commanding. He is still a king who accomplishes his will, supremely, unstoppably. And he does it for his own glory and yet at the same time for our salvation and perpetual good. For the picture is not just about Jesus, but also about us. The centre of the picture is occupied not by him, but by the first of the freed captives as they pour up out of darkness and towards the light. This figure is thought to represent Abraham – the father of all those who have been saved through faith. They offer up their hands together in prayer. Jesus with one hand embraces both hands of the believer. It is a gesture that implies warmth, care and blessing, as he draws the believer towards him. As we celebrate Easter Sunday, the day on which Jesus by his physical resurrection from the dead was proved ‘with power’ to be the sinless Son of God and Messiah (Romans 1:4), we celebrate a victory – over sin, Satan and death. Jesus is supremely stronger than any of his foes; he always accomplishes his will. And, as Paul tells us in Ephesians 1:19-20, God’s ‘mighty strength, which he exerted in Christ when he raised him from the dead and seated him at his right hand in the heavenly realms’ is now at work in our individual lives, if we have put our trust in him. This is the Jesus of Fra Angelico’s image: gracious and kind, irresistibly active in bringing about the fullness of salvation for you and for me. 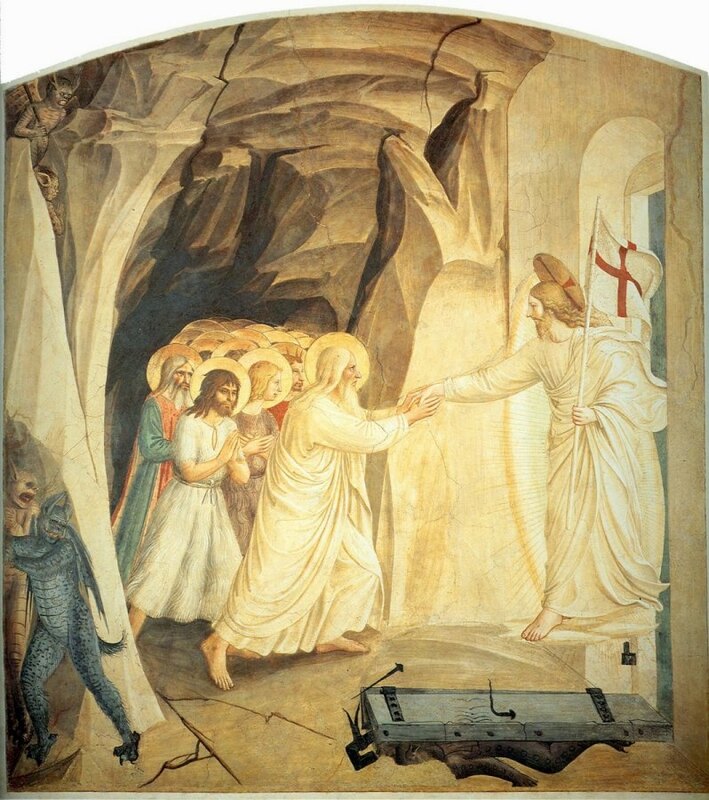 Fra Angelico: Christ in Limbo, c. 1450; fresco; 183 x 166 cm; cell 31 of the cloister, Museo di San Marco, Florence.